Remove any fronds from the fennel and set aside. 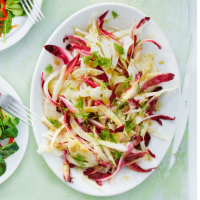 Slice the fennel as finely as you can, ideally using a mandoline, avoiding the tough central core (cut it out when you reach it). Put in a large bowl of iced water. Cut the chicory leaves into shards and add to the bowl; chill for 30 minutes to crisp up. Meanwhile, whizz the anchovy fillets, oil, vinegar and garlic in a small food processor or blender until smooth. Drain the fennel and chicory, discarding any ice, and pat dry on kitchen paper. Toss with the dressing, scatter over the fennel fronds and serve immediately.